Something pretty interesting has been happening in the GPU IP industry as of late. Intel introduced its brand new Devil’s Canyon NUC with AMD XConncect technology and it has already previously stated its plans to adopt FreeSync in upcoming iGPUs. With the cross-licensing agreement it has from Nvidia set to expire in Q1 2017 – whispers are starting that the silicon giant may be seeking a partnership with AMD this time around. Intel currently has a cross-licensing agreement with Nvidia which allows it to use its GPU intellectual property in its own homemade iGPUs. This particular deal with Nvidia, which will expire in Q1 2017 is the source of approximately 66 Million Dollars per quarter for Nvidia Corporation (or approximately $264 Million per fiscal year) since it gets a piece of the pie for every iGPU Intel ships. 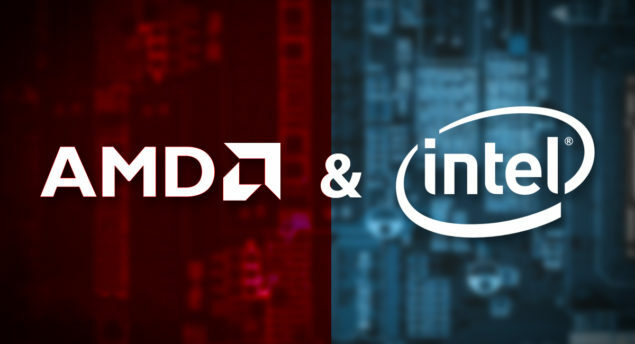 According to whispers however, Intel is now in talks with AMD to take over from Q1 2017. Intel has been venturing into AMD territory for quite a while now. It pledged support for the AMD powered FreeSync technology (aka VESA A Sync) over Nvidia’s proprietary G-Sync for its future processors and also recently released its flagship Skull Canyon NUC with support for AMD XConnect tech. All these point towards a fondness for the mostly open source nature of the red silicon maker. While there is no word on the exact dollar figures of this particular deal it is quite possible that AMD is willing to offer a sweeter deal than Nvidia. Currently, the most powerful iGPU Intel has is the Iris Pro 580 (approximately equal to a desktop GTX 750) which is insanely powerful for an integrated GPU. If this deal with AMD is successful however, than we might actually see it shifting to something very similar to a GCN based architecture depending on what kind of licensing they are able to achieve. There could be several caveats associated with this idea however, one of the primary ones being that Nvidia holds the IP of some key GPU technologies that are employed in modern GPUs. Shifting over to AMD might actually require Intel to have a cross licensing agreement with both companies. Then again, Nvidia was not able to enforce its patents in the Nvidia v Samsung case, which is a very big precedent in the industrial world – so it could easily end up happening with or without Nvidia’s consent. As far as financial outlooks go – according to Barrons, investors of Nvidia aren’t expecting this deal to be renewed after the royalty ‘cliff’ in 2017. In fact if it ends up being renewed, this will be something that will exceed analyst expectations. AMD on the other hand could stand to benefit greatly from an agreement like this. Not only could ~50 Million dollars make the difference between being in profit (at Net Income) but it could help solidify its RTG momentum that has been such a resounding success so far.